Docly (www.docly.com) is an interesting application, designed especially for professional writers. What sets Docly apart from other web-based word processors is its focus on copyright management, including the ability to assign a document a Creative Commons license or a traditional “all rights reserved” license. This means that not only can you share and publish your Docly documents, you can also offer them for sale. Creative Commons is a not-for-profit organization that has released several different copyright licenses that regular people can use to restrict how others use their work. Learn more at www.creativecommons.org. As you can see in Figure 6, Docly offers a minimalist approach to editing and formatting. The editing window itself is rather small, in part to make room for a bewildering number of formatting buttons in a toolbar on top. It’s not the most elegant interface, but it gets the basic job done. Figure 6. Docly’s small and confusing text-editing interface. Glide Write (www.glidedigital.com) is part of the Glide Business suite of web-based applications. Glide Write itself is an elegant word processor that just happens to integrate seamlessly with other Glide applications, including email and chat. In addition, Glide documents can be viewed on a number of smartphones, including the iPhone, T-Mobile SideKick, and a handful of Treo and BlackBerry models. 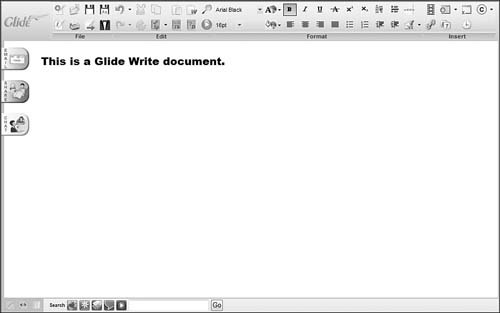 As you can see in Figure 7, a Glide Write document opens in its new window. You have the normal toolbar of editing and formatting functions on top, with the document displayed below. Along the side are three tabs: Email, Share, and Chat. Click the Share tab and Glide displays a window that lets you designate which contacts you want to share with. These contacts then receive an email that includes a link to the web-based document’s URL, where they can view or edit the document as desired. Figure 7. Editing a sharable document with Glide Write. 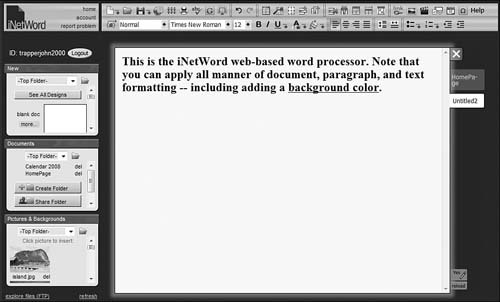 The iNetWord (www.inetword.com) web-based word processor is a full-featured application. As you can see in Figure 8, iNetWord features a tabbed interface, with each open document appearing on its own tab.  You get support for page backgrounds, borders, page numbering, tables, images, and the like. It even comes with a number of predesigned templates for common types of documents. Figure 8. The tabbed interface of iNetWord. For group collaboration, iNetWord lets you share individual documents or entire folders. Changes made by other users are highlighted onscreen, and it’s easy to revert back to a previous version. 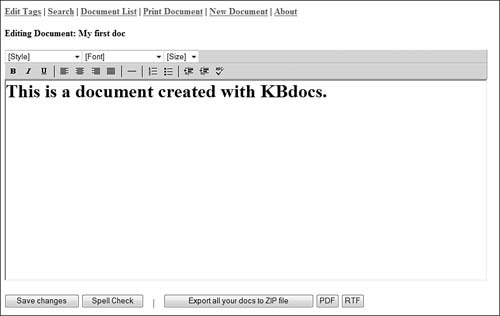 As evident in Figure 9, KBdocs (www.kbdocs.com) is a no-frills online word processor. There are only limited formatting options, and it doesn’t have any sharing or collaboration features. That said, it’s probably the easiest-to-use web-based word processor, especially for newbies; just pick a username and password, click Enter, and you’re ready to go. Figure 9. The minimalist interface of KBDocs. Peepel WebWriter (www.peepel.com) is part of a multi-application web-based office suite. As you can see in Figure 10, the Peepel interface is a trifle unusual: The document you’re editing appears in its own window, on top of the larger home window that holds the toolbar and tabs that you use to edit and format the document. If you can get past this little quirk, Peepel offers some interesting features, including the ability to edit your documents offline if you don’t have an Internet connection. Figure 10. Peepel WebWriter’s unusual interface. Group collaboration is a snap. After you’ve saved a document, click the Sharing tab to see all of Peepel’s sharing options. You can assign Read and Write access to different users; all you need to supply is each collaborator’s email address. 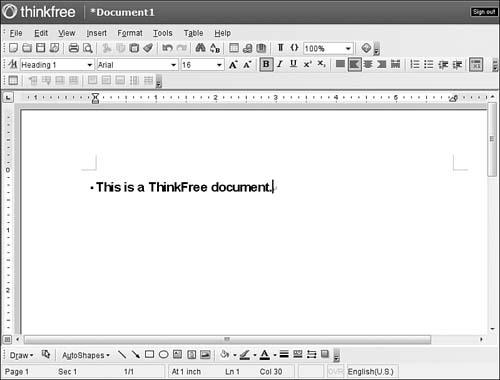 ThinkFree Write (www.thinkfree.com) is a Java-based online word processor. That lets ThinkFree mimic the Word 2003 interface, as you can see for yourself in Figure 11. Each new document opens in its own window, each of which has a Word-like pull-down menu and toolbar. The editing and formatting functions are also quite Word-like, complete with styles, editing marks, fields, an autocorrect function, and the like. Figure 11. ThinkFree Write—a very Word-like word processor. If collaboration is your game, consider WriteBoard (www.writeboard.com), a web-based word processor designed with group collaboration in mind. WriteBoard isn’t the most full-featured word processor on the web, but it does make collaboration between multiple users remarkably easy. Figure 12. 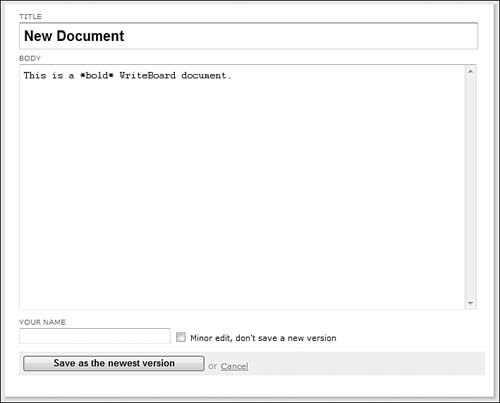 WriteBoard’s incredibly bare-bones interface. But creating pretty documents is not what WriteBoard’s about. What it really is, is a wiki-style group text editor. After you create a document and share it with others, it’s easy to compare different versions of the document; every time you or someone else saves an edit, a new version of the document is created and linked to in the sidebar. You can even subscribe to RSS feeds for your documents, so you’ll be automatically notified of changes. 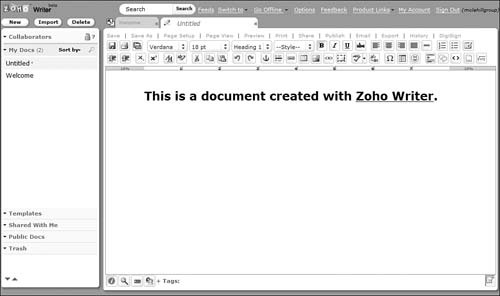 Case in point: Zoho Writer (writer.zoho.com), which easily holds its own, if not surpasses, Google Docs in the web-based word processor race. As you can see in Figure 13, multiple documents display in a single window, thanks to Zoho Writer’s tabbed interface. You get all the standard editing and formatting features, as well as page numbering, headers and footers, footnotes and endnotes, tables of contents, and other advanced features not found in all other web-based word processors. Figure 13. 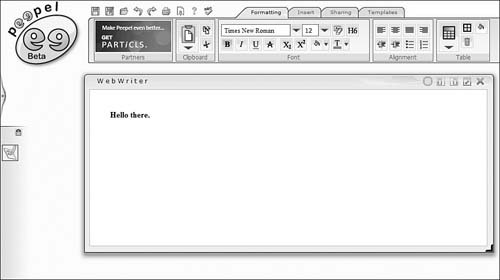 Zoho Writer—a full-featured web-based word processor. Naturally, Zoho Writer offers robust sharing and collaboration features. 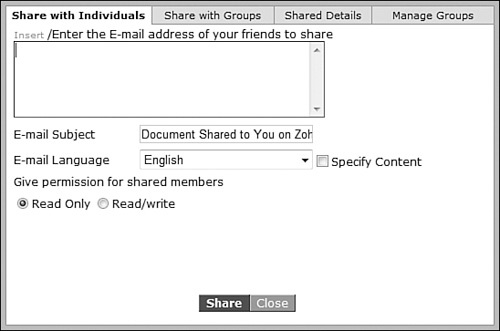 You can share a document with individuals or with groups on either a read-only or read/write basis. Sharing is as easy as clicking the Share tab; this displays the window shown in Figure 14. Enter the email addresses of individuals (or the names of predefined groups), select the permission level, and then click the Share button. The chosen collaborators will receive an email inviting them to the shared document on the web. Figure 14. Sharing a document with Zoho Writer. Many experts believe that web-based office suites will eventually replace traditional desktop software suites, because fewer and fewer users are working at a fixed desktop. As users become more mobile, the advantages of cloud-based applications become more notable. As long as an Internet connection is handy, web-based docs can be accessed from almost anywhere. In addition, companies and organizations (and individuals) are starting to balk at the never-ending cost of Microsoft desktop applications. Companies pay $200 to $500 for the Office suite and are forced to upgrade every few years. Most web-based suites are free or very low cost, and are upgraded (also for free) on a continuing basis. A web-based application costs less to obtain and to maintain than Microsoft Office—and when you have hundreds or thousands of users in an organization, this kind of cost savings can’t be ignored. That said, it will take a long time for organizations to completely switch from Office to web-based alternatives. It’s a matter of inertia, which rules larger organizations; it’s simply a lot of trouble to switch platforms, even when considerable cost savings can be applied. (It also introduces challenges in sharing documents with those still using Word outside the organization.) But change does happen, albeit slowly, and the writing is on the wall. It’s unlikely that the office application environment will look the same 10 years from now as it does today. Of these suites, Google Docs has the largest installed base today; many companies, organizations, and educational institutions have already switched from Microsoft Office to Google’s free web-based applications. But don’t rule out any of the competing suites, nor should you expect Microsoft to sit out the cloud services revolution forever. It might take some time to shake out, but shake out it will. Eventually, nearly all office computing will be done in the cloud.